Ban Lan Gen (Isatis Root) has antiviral and antibacterial effects and immune strengthening effects. Ban Lan Gen helps clear away heat and toxins, remove heat from the blood, subdue swelling, and relieve sore throats. Isatis Root, Leaf of Indigowoad, Dandelion, Herb of Heartleaf Houttuynia, Herb of Capillary Wormwood, Honeysuckle, Cane Sugar. Antibacterial, antiviral, strengthens immune system, clears Heat and toxins, remove heat from the Blood, reduce swelling and relieve sore throat. Fevers due to epidemic febrile disease, eruptions due to toxic heat, throat inflammation, mumps, erysipelas, acute conjunctivitis, skin and external diseases, carbuncle, and swelling. Adults 2 to 3 times a day, 1 to 2 packs each time. Dissolve in a cup of boiling water, stir well before serving. Not to exceed 6 bags within a 24 hour period. 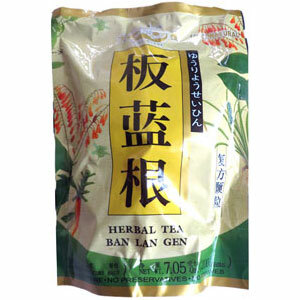 Be the first to review “Ban Lan Gen Herbal Tea” Click here to cancel reply.